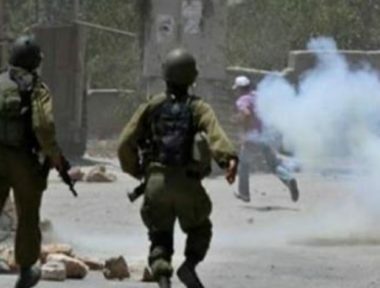 Dozens of Israeli soldiers invaded, Tuesday, Abu Dis town, east of occupied East Jerusalem, and injured seventeen Palestinians during ensuing protests. Media sources said the soldiers invaded the Schools Area, near the Al-Quds University, and surrounded the local Secondary School. They added that the school provides education to 800 students, and that the pupils protested the invasion, especially when the soldiers surrounded their educational facility. The army fired many rubber-coated steel bullets and gas bombs, causing at least 17 Palestinians to suffer the effects of teargas inhalation.